There have been attempts by the Organisation for Security and Cooperation in Europe to rewrite the Medvedev-Sarkozy agreement reached by the two presidents on September 8 says Russia’s Ambassador to the UN. According to the agreement signed in Moscow the presence of EU observers in buffer zones outside South Ossetia and Abkhazia will be enforced, allowing Russian troops to leave security zones by October 1 and return to pre-conflict positions. 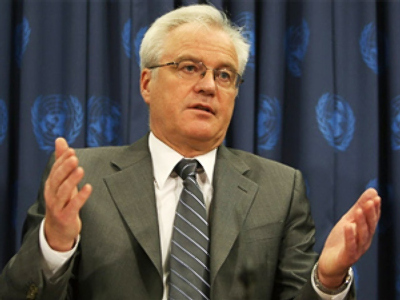 Speaking at the annual meeting of the OSCE's Parliamentary Assembly in Toronto, Russia’s UN envoy Vitaly Churkin said there were problems implementing points of the agreement but they didn’t originate on the Russian side. He said the OSCE had attempted to rewrite the document and when they failed to do so, they refused to take part in further consultations. Churkin reminded that according to the agreement, monitors should be stationed in security zones bordering South Ossetia and Abkhazia in order to prevent a repetition of Georgia’s aggression. The diplomat has called on the representatives of European parliaments to use their authority and power and sort out this issue. He also said that Russia had already fulfilled its obligations. Representatives of more than 40 European parliaments have gathered for the meeting in Canada. The parliamentarians have proposed launching an international inquiry into the South Ossetian conflict. Russia has backed the idea.